I wanted meringues with the flavor of strawberry rhubarb pie and I certainly couldn't achieve that goal by adding fresh fruit. Instead, I mixed in sifted strawberry rhubarb powder. Bring a pot of water to a low simmer. Set a heatproof bowl over the pot and add egg whites and sugar. Stir regularly until sugar completely dissolves (about 3 minutes). Remove the bowl from the heat and mix in salt and cream of tartar. Beat on high speed until stiff peaks form (about 5 minutes). Sift in strawberry rhubarb powder and gently stir to combine. Reserve any chunks of powder that don't fit through the sifter. Line two cookie sheets with parchment paper or a Silpat. Using a large round pastry tip, pipe swirls of meringue (any size you'd like) onto the lined cookie sheets. Leave a little space (about an inch) between the meringues to allow for their growth during baking. 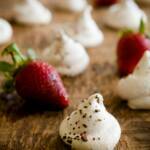 Sprinkle piped meringues with reserved chunks of fruit powder. Bake for an hour and 15 minutes or until the meringues are crisp on the outside but still soft on the inside. This recipe is my slight adaptation of Martha Stewart's meringue cookie recipe.